There was an 18.5 percent increase in drug spending from 2015 to 2017, according to a new infographic by the American Hospital Association. 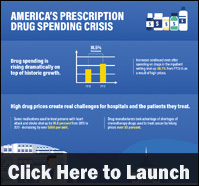 The infographic examines prescription drug spending and the impact on hospitals and patients. Infographic: The Prescription Drug Price Tsunami – Are We Powerless? Prescription drugs use are the source of a significant amount of healthcare costs. Over the last decade, the percentage of Americans using five or more prescription drugs increased by 70 percent, according to a new infographic from Healthcoverageally.com. This infographic also details prescription drug use in America, the cost of prescription drugs in America in comparison with other countries, the result of expensive prescription prices, and potential reasons for such high prices. 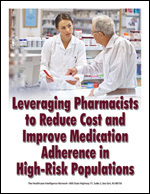 You may also be interested in this related resource: Drug Benefit Trends and Strategies: 2013. Posted in Healthcare Costs, Infographics, Prescription Drugs | Comments Off on Infographic: The Prescription Drug Price Tsunami – Are We Powerless?